When I first saw the Pebble I was honestly amazed. As the amazement wore off and the waiting settled in, I daydreamed about receiving notifications and being able to control my music from my wrist. Then, I received my Pebble and reality took over. Now that I’ve had the Pebble for a week I’ve resorted to turning off the Bluetooth and using the watch to tell time and play Snake. Was it worth $150 for that? Not really, but I do love being able to shake my wrist to activate the backlight. Even though I’m generally disappointed with the Pebble, having it has made me think more about what a smartwatch should do and whether or not it’s a product that has the potential to change the way we interact with the world around us in a meaningful way. I think smartwatches will be like the first cell phones and smartphones. When the first cell phones came out people questioned why you would want to take calls anywhere. Smartphones simply extended that question to emails and the web. What we found was that we were able to stay connected with people, our information, and the world around us in insanely meaningful ways. We also found that our lives became increasingly more cluttered and distracted because of the influx of information and the ease with which we could be accessed. 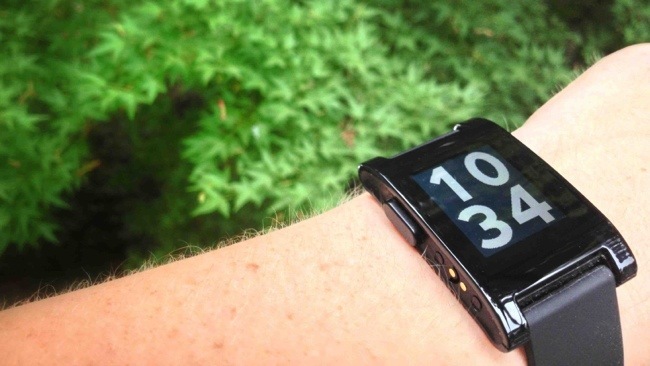 Smartwatches will never be the next smartphone, but they may be useful in some circumstances. We’ve already seen some of the initial reactions to smartwatches and they fall in line with early responses to cell phones and smartphones. Are you so lazy that you can’t just pull your phone out? Do you think you’re that important that you need to have yet another device? Chances are none of us are really that lazy or that important, but the idea of having another device to keep us even more connected in an unobtrusive way may still be tantalizing. If (and this is still a big “if” at this juncture) smartwatches are able to show us information and interact with data in a meaningful way, they could be a major new disruption in the market. That said, I don’t think anyone is going to solve the big problems (UI, battery life, input) facing smartwatches without making some incredible compromises that will push most consumers out of the market. Those of us remaining who have the money and the patience, however, may be looking for the ideal product for a while. The largest obstacle facing smartwatches is, of course, input. So you have a connected device that is able to show you notifications and information about what’s going on around you. Fine, but how do you input responses to interact with those notifications or information? Voice is a possibility, but it can’t be the only solution. There are simply too many situations where talking at your watch won’t be appropriate, much less expedient. Trying to put a keyboard on a watch is even more laughable. The only solution that makes any sense to me is to have three possible responses to a notification like a text message or an email: dismiss, mark as read, and respond with a canned message. This would deal with most situations and make the watch useful beyond telling you what you already know – your phone just buzzed. If the notification is something you need to respond to later or in detail, you hit dismiss; if the notification is something you need to read, but not respond to, you hit mark as read; if the notification is something you need to respond to generically, you pick a canned response that you’ve prepared. You might be thinking, “But I already do this with my phone. Doing that on my watch doesn’t actually help me.” You’re right; most of the time this sort of interaction won’t be helpful unless you’re in a meeting and can respond in one of the first two ways. Often times I’ll be in the middle of a conversation with someone and receive a phone call or text message. With my Pebble I’m (usually) able to tell if it’s something I need to deal with immediately or not with a quick glance to my wrist. It’s a subtle difference, but I can honestly say I’ve found it beneficial. Another instance where I’ve found this sort of response helpful is when I’m driving. I know some of you live in states where public transportation exists and traffic is something you hear about in movies, but in southern California traffic is an integral part of life. Every day I travel for at least 40 minutes between home and work, sometimes more. Being able to quickly glance at my wrist to see what the notification is instead of changing my field of vision completely to glance at my phone is much, much safer. Again, this is subtle, but I’ve found it beneficial. The second problem facing smartwatches is whether or not context can be used to the watch’s advantage. This is something that is still wildly underused on most smartphones. When we set up a new phone we go through the process of allowing Google and the manufacturer and the carrier to know where we are through GPS and wireless triangulation, but our phones still underuse that data. Apps like Groupon and Eye in the Sky use your location for deals and weather, but the vast majority of apps and services still don’t use this data for our advantage. The classic example of using location data is walking into a Starbucks (or whatever coffee shop you frequent) and having your Gold Card show up for you to pay for your drink. Right now that sort of thing shows up on your phone, but it could also show up right on your watch for the barista to scan. If you have your headphones plugged in, your smartwatch could prompt you to start playing your favorite playlist. While you’re waiting for your drink to hit the bar your watch could notify you that the friend you’re scheduled to meet is about 5 minutes away. While you wait, your watch could show you your unread emails, things left on a to do list you have in Google Keep, or show you headlines from Google News. This might sound like a lot to do on such a small screen. As a Palm Pre 2 owner, believe me when I say that you can see a lot of information on a smaller screen than you might imagine. These are all things that you could do on your phone (although some of these actions really aren’t available on phones still), but a smartwatch is uniquely positioned to be able to show you summaries of your content, notifications, and things to do in a quick way without having to jump through tons of apps. Again, this sort of summarization would be great to see in Now or even in DayDream, but I think it would be a good fit on a watch too. Like I said, I don’t think smart watches are the next big revolution in technology. Over the past few decades we’ve seen the computer go from something that takes up an entire room to something that fits in your pocket. While we may see it get miniaturized to the size of a watch, it will be forced to have limited capabilities because limited size limits utility. I hope we’ll see innovation in that space that doesn’t involve imaginary projected keyboards, but until then smartwatches will have minimal applications outside of time, notifications, displaying directions while driving, and summarizing information.